Time for bread. But with a clean conscience. Do you love bread, but your muscles prefer protein? Are carbs killing your beach body? Then our vegan protein bread is right for you. Fewer carbohydrates and more protein are a treat for your muscles. Satisfying fibres make hunger pangs a thing of the past. And high-quality seeds and superfoods provide an extra-kick of nutrients. In 100% organic quality, of course. Finally, bread you can really enjoy. The secret ingredients? No gluten. No chemicals. Forget gluten bombs, inferior soy and artificial additives. Our vegan protein bread contains high-quality vegetable protein for your muscles. Valuable superfoods supply you with an extra portion of nutrients. Satisfying fibres? You can bet there are. Psyllium husks create the perfect fluffy consistency. Including crispy crusts. As tasty as fresh bread from the bakery. But even better. Does a vegan diet provide too little protein? With our vegan protein bread, that's history. High-quality pumpkin seed and sunflower seed protein meets natural protein from almond flour. A protein mix that has everything you need. And tastes simply delicious. With nutritional values that speak for themselves: 11 g of protein and 2 g of carbohydrates per portion* For comparison: Classic wheat bread contains exactly the opposite. A whole 13 g of protein and just 3.5 g of carbohydrates. That is what 2 crunchy slices of our protein bread deliver. ** As a comparison: It is exactly the opposite in the same amount of classic wheat bread. This is due to an elaborate combination of different sources of protein. The protein kick is delivered by milk and egg proteins. One comes from pure pasture milk. The other from free range chickens. It is all rounded off with a perfect blend of almond flour and superfoods. 3. Bake on the middle shelf in a pre-heated oven at 175 °C for approx. 50 mins. The exact baking time may vary depending on the oven. ** In comparison with regular mixed wheat bread. *** Information is relevant to the baked bread made using the entire protein bread baking mixture, from which 1 slice of our protein bread should weigh an average of 25 g. It’s worth noting that the actual weight and nutritional values may vary slightly. It is important to maintain a varied and balanced diet and a healthy lifestyle. May contain traces of soy, peanuts and other nuts. Add 230 ml water to the baking mixture and mix until you get an even dough. Place the dough on a prepared baking tray or into a greased baking form of your choice. Bake on the middle shelf of your preheated oven at 175 °C for approx. 50 minutes. Note: The exact baking time may vary depending on your oven. If baking in a fan-assisted oven, keep an eye on the bread after 40 minutes, as less baking time may be required depending on temperature distribution. Our protein bread is completely free of preservatives. That is why we recommend that you eat the baked bread within 2 days. The baked protein bread can also be frozen in portions and thawed as required. You can test with a knife to see if the bread is baked through: Stick the knife vertically into the thickest part of the bread. If you pull the knife out and there is no dough stuck to it, then the bread is done. In fan-assisted ovens, you can already test the bread after approx. 40 minutes. One baking mixture (230 g) produces about 360 g of bread. Rinse the chickpeas with water and allow to drip dry. Mix to a creamy consistency with the rest of the ingredients. Use a handheld mixer or food processor. Spread 1 tbsp of hummus on each of the slices of bread. Store the rest in the refrigerator. Top with beansprouts, chickpeas, sesame and sea salt to taste. Place several lettuce leaves on the slices of bread. Cut the avocado into slices and place on the bread. Season to taste with salt, pepper and chili flakes. Simmer the strawberries in a pan for 10 minutes, together with the agave syrup. Mash the strawberries with a fork. If you prefer a creamy consistency, you can also purée them. Mix in the chia seeds and allow to cool. Allow to soak for at least 30 minutes. Spread the jam on the two slices of bread. Are vegan proteins sourced from anywhere other than plants? Vegetable proteins are just as valuable as animal proteins. Particularly when you select them carefully and combine them in the right way. For our vegan protein bread, our food scientists and chefs have done exactly that. That's why our vegan protein bread supplies you with the ideal mix of proteins, topped with the best of selected seeds and superfoods. Another benefit of vegan protein sources: They conserve resources and add variety to your diet. A treat for your body and your palate. Because protein bread has nutritional values that take you further. Two average slices will contain a whopping 11 g of protein, but only 3.1 g of carbohydrates. *** In addition to that, there are also a whole lot of healthy fats and micro nutrients in grainy superfoods. You will stay fuller for longer, as our protein bread is particularly high in fibre. A real win over white flour products. Yes, our protein bread is suitable for daily consumption. Like with any diet that is rich in protein, you should make sure to drink enough water. As a rule of thumb: Those who consume more than 1.5 g of protein per kg of body weight should drink at least 2-3 litres of water per day. What is the consistency of protein bread? Soft, yet firm to bite. The high protein content ensures a soft and fluffy consistency. The superfoods and seeds create that firmness. And the crust? Irresistibly crispy. By the way: Don’t be surprised if the dough becomes a bit too runny when you mix it. Once you have let it rest for 30 minutes, it should have the perfect consistency to knead and shape. How much fat is in the protein bread? Two slices of protein bread contain 8.3 g of fat. ** The fats come from the seeds and grains. For example, linseeds, almonds and sesame seeds contain healthy fats. There are no trans fats or cheap oils in our protein bread. How long can I store the protein bread? Our protein bread can be kept in a bread bin at room temperature for approx. 2 days after it has been baked, as ours – in contrast to many other protein breads – does not contain any artificial additives and conservatives. If you want to enjoy it for longer, then simply slice the bread once it has cooled and freeze the slices in a freezer bag. You can then either thaw or toast the bread slices in your toaster as desired. The high protein content of our bread will not be altered. By the way: It doesn’t matter if you let the dough rise for a few extra minutes. We do recommend keeping an eye on the time, however, so you can get the best possible results. Why is the packet so small? Because we don’t use any artificial ingredients or conservatives. As our protein bread is solely made using high quality and natural ingredients, it is important to bake it fresh every time. If you want even more out of it, then our pack of 5 is just the right thing for you. This saves you 10% and you can bake as much as you can eat. 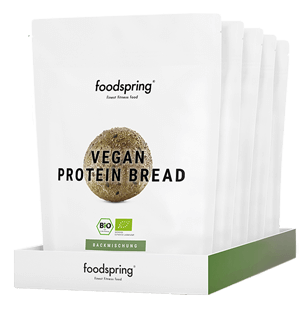 Vegan protein bread 5-pack will be back in stock shortly.